Hi all. I looked through all the posts and could not find a thread about what I'm going to ask. I am having a small problem and I'm sure I'm doing something wrong, that I set the card in PCS as 5x7 and when I import the SVG it's 5.640 and 8.238, something crazy like that. Any ideas why the size changes? Wow thanks for looking that's really nice! 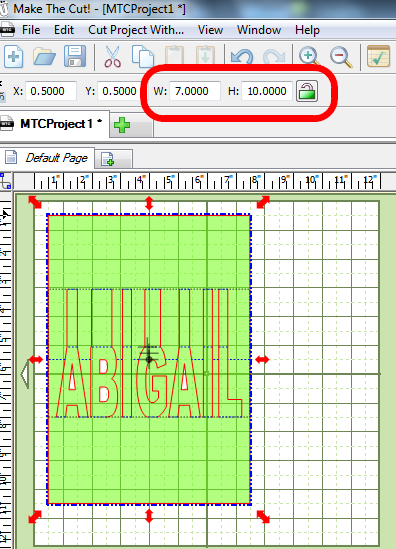 This really isn't a big deal because I can resize it in Silhouette Studio but I was wondering why it would happen if you set the size when you start the design. Today I was thinking that it would be really great if this program gave you the option to print the SVG or PDF backwards so you can cut from the back of design paper. Do you happen to know if that's possible within the program? I know I can do it from my printer preferences. Thanks for your help!!!! I am still confused why you have an issue - if I cut to my zing the popup is the size that I set for the page and page size can change. You can export as svg and print what you see on the svg. Have you tried export - machine settings - svg? It must be that silhouette studio imports the svg exported from pcs at a different size. Not all programs are standardized as far as importing svgs.